Catch world-famous acts on the sand, indulge in a lush seafood feast in Mevagissey or geek out with the gamers at Heartlands – there’s something for everyone to enjoy in Cornwall this week…. Mevagissey’s annual Feast Week is thought to be one of the longest standing celebrations in Cornwall. Head to this beautiful fishing town to enjoy a week of exhibitions, demonstrations, live music and lots of excellent seafood. Along with choirs and bands, flora dances, children’s entertainment and competitions, plus parades, boat and raft races, a fete and a huge firework display on the closing night. A popular spot on the Cornish feast-night circuit, Knightor winery events are themed or ingredient-led from one of the fantastic local producers they work with. The evening kicks off with drinks and nibbles outside, before moving into the threshing barn to eat. This month, you can choose from The Cornish Moonshine feast featuring unaged white whiskey and an American style BBQ menu or a Brazilian BBQ feast with beef as the star of the show, cooked over fire and eaten outside in our gorgeous courtyard. 3 courses and a cocktail cost £20 per person. This is a brand new music event for Cornwall in the beautiful walled orchard at The National Trust’s Trengwainton Gardens. A bit more low-key than Cornwall’s big summer festivals (and very affordable too), this is a relaxed event showcasing some fab local bands. The line-up includes: Flats and Sharps (5 young men writing and performing blistering bluegrass, folk, country & pop), Stone Roots (4-piece funk-pop band) and Gwelhellin (acoustic jazz). There will be a bar and BBQ for refreshments and tickets are just £7 in advance or £9 on the door. Now in its third year, Tunes in the Dunes is back at the end of the month, with four stages and an awesome line-up. Dance on the sand to Primal Scream, Xavier Rudd, John Newman, KT Tunstall, Billy Ocean, Example, The Levellers, Izzy Bizu and loads more. You can also expect lots of cool, beach festival happenings – a kids area, yoga, a beach waterslide, a rum bar, a gin bar and a secret beach party. The world swell board championships will also be in town for the weekend, so there’ll be loads to keep you entertained on the sand and in the sea. A real highlight of the year at The Old Coastguard. This is a glorious garden party with a backdrop to die for. Formally known as Sea, Salts & Ales, the OC’s biannual festival was so successful last year they’ve decided to bring it back every year and have changed the name to fit. At Ale & Anchor this year you can expect the same laid-back vibe; a great line up of bands and delicious in-house BBQ. This big summer show from renowned Cornish company, Miracle Theatre will be popping up all over the Duchy in the second half of the month. 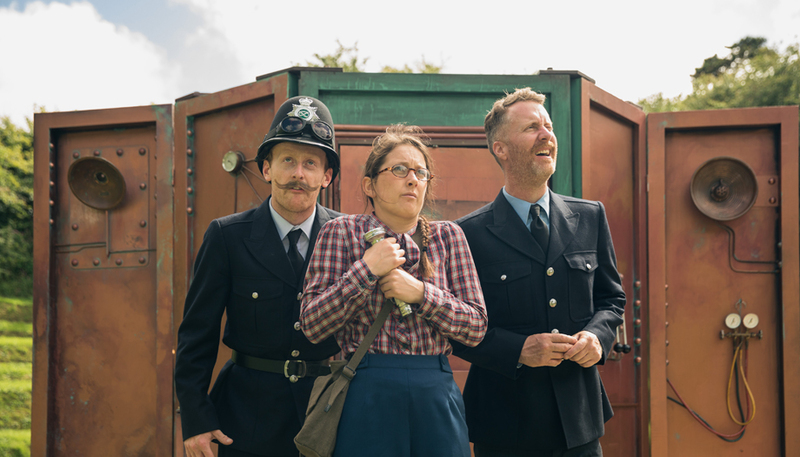 The production, written by Flann O’Brien, ventures into a world somewhere between Alice and Wonderland and the Marx Brothers, where the earth is not round but sausage shaped and night is actually and accumulation of black air; where eccentric policemen fall in love with bicycles and you can visit eternity via a rickety life, hidden in the heart of rural Ireland. Sounds delightfully bonkers to me and even better to catch it at a unique and unexpected Cornish venue, like Bedruthan Hotel’s cliff top theatre, The Woods Café at Cardinham Woods or The Lost Gardens of Heligan. Muddy award-winning Theatre Sterts is a favourite here at Muddy HQ. Their in-house shows are just as professional as the touring productions and this week, they taking on Shakespeare’s Macbeth. Sterts is a natural amphitheatre in the grounds of an old pig farm but the bonus is, it’s covered by a giant tent. That means it’s practically all weather and you won’t get wet. However, it can get a bit chilly once the sun has gone down, so regulars come armed with blankets, coats and a cushion or two for added luxury. This historic outdoor theatre (since 1948) seats about 300 people and is built on the site of the old Penlee House tennis courts, with a turfed area that acts as the stage and an enchanting fairy-lit entrance. The last shows of June include The Vicar of Dibley, this Tuesday and Wednesday and on Friday, singer Sarah McQuaid will be performing. Don’t forget to order a warming, pre-show curry and naan bread for evening performances. Got a fully-fledged geek in the family? Swing over to Heartlands this week, where their tribe is surely waiting. I admit, I had to Google Cosplay – dressing up as characters from films and video games (especially manga), but it all looks like a lot of fun. Indulge your passion for video games, board games, nerf battles, archery and other great geeky stuff.